Due to popular demand we've added a second Pura Vida Retreat March 27-April 2, 2017! Click here for details and to register! 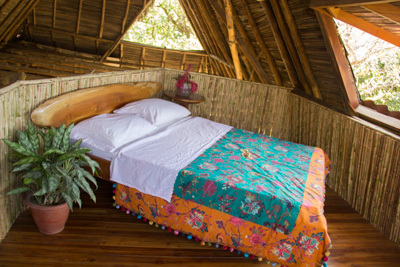 We'll take over a lush secluded retreat center for 6 days & nights of making art, nurturing relationships with other women, and adventuring in the jungle paradise of the Nicoya Peninsula in Costa Rica. Our group will lodge in a private villa compound with our own pool and secret path to the beach surrounded by jungle, falling asleep to the sound of the surf. Each morning after a delicious breakfast served by our house cook, there will be optional yoga and surf lessons on the beach to begin our day, these lessons will be taught by our own instructors. Each day after morning beach time Mati Rose McDonough and I are teaming up to take you on a layered painting adventure, we'll dive into lessons on our gigantic open air porch filled with hammocks and comfy couches. We will begin each day diving into layers of Watercolor for our Watercolor warm ups practice. Then in morning and afternoon workshops we'll lead you through collage, working with stencils, silk screening, spray painting, gold leafing, layering with drips and washes, incorporating geometrics, and creating abstract layers along with painted Mandalas and Feather Power Girls! At the end of our time together you'll leave with 3 finished paintings and tons of new skills under your belt to invigorate your painting practice back home! daily painting lessons by both Faith & Mati…using our jungle beach location for inspiration we’ll dive into mixed media layered goodness with lessons in creating abstract paintings through a variety of marks and materials to express natural space and tropical inspiration. Through a slow build up of process you’ll create three large paintings in our open air studio. Mati and Faith will lead you through lessons in collage, wash painting, stenciling, silk screening, spray painting along with painted mandalas and feather power girls. You’ll come away with work that you love, and lots of new ways of seeing and working, to take home to jump start your own studio practice. 24 hour access to our art supply buffet which will be set up throughout our stay for you to create & explore with...paints, silkscreens, stencils, brushes. Students will be asked to bring along their own canvases, watercolor and acrylic paints. If you have favorite supplies from home we ask that you bring those along, we'll send out a recommended supply list!